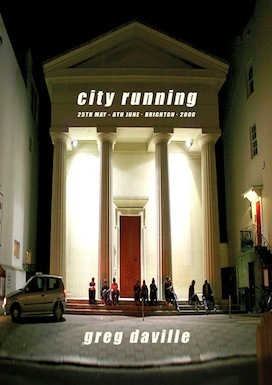 The idea for City Running - as a nocturnal live art event in which a range of artists, working in different disciplines, respond to the city at night-time - was originally conceived by artist Greg Daville for Brighton Fringe Festival 2006. Over 40 practitioners contributed an initial piece of work for an exhibition at Phoenix Gallery in Brighton; then, on the following Saturdays over a five week period, a number of these artists would set out from Phoenix at 11pm to "complete a reconnaissance, gather material, or execute an intervention". At around midnight the City Runners returned to base and had two hours to create a piece of work inspired by what they had seen and experienced. The contributors then presented this work to any peers and public that were in the gallery from around 2am right into the early hours, allowing discussion of the work and its creative processes. A new exhibit representing the work created during the city run then replaced the initial exhibit so that the exhibition gradually transformed itself throughout the project. Following the untimely death of Greg Daville in April 2007, artist Rowena Easton became the new Artistic Director for City Running. This eventually led to City Running Bristol, hosted by MAYK on 30 November 2012, following a similar but slightly repackaged format that contained an entire City Running project within one intensive evening. In Bristol, 30 artists were invited to explore the Temple Quarter 'Enterprise Zone'. Staged at Paintworks on Bath Road, this City Running was also the launch event for a project aiming to commission new pop-up cultural and creative experiences in the Zone. The original gallery exhibit was a text piece, completed in ink and other materials on hand-made paper as well as being directly applied to the gallery wall. 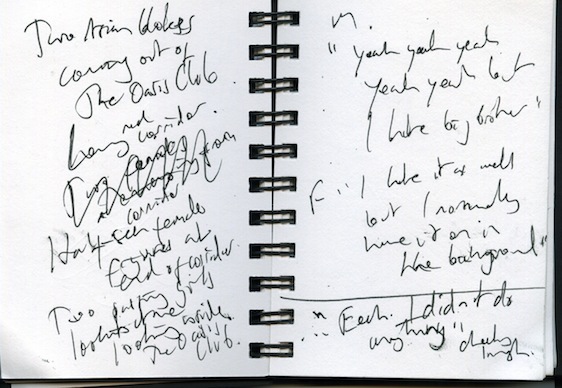 During his City Run, MCH filled a notebook with fleeting observations, recording the sights and sounds of the city and his interaction with late night revellers, returning to the gallery at midnight to recreate his experience in detail from memories triggered by the disjointed notes. 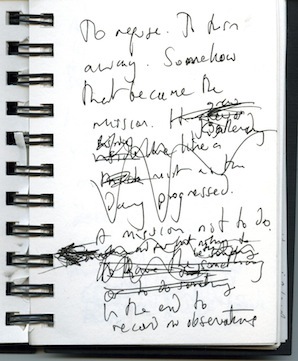 The original exhibition was replaced in the gallery by the notebook used during the 'run'. For the Bristol run, Hewitt explored the dubious avenue of seeking to respond by not seeking a respond. A 100 page richly illustrated full colour book about the Brighton City Run, designed by Greg Daville, is available print-on-demand from Lulu.com. 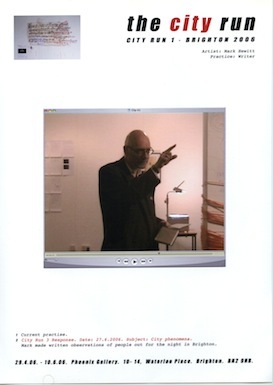 The first half of the book is made up of documentation and feedback; the second half gives information on the individual contributions of participating artists. Visit the Lulu website to purchase the book online.